Each garment is constructed by number of stitching jobs and non-sewing jobs. Jobs or activity involved in making a garment is known as operations. In industrial garment manufacturing, prior to making the garments, the sample is studied and list of required operations for making the approved design are made. The operations are written in a sequence of actual process flow to be followed while making the garment in the shop floor. The method of preparing operations' list in a sequence is called as operation breakdown. The sheet of listed operations of a style is also known as operation breakdown. 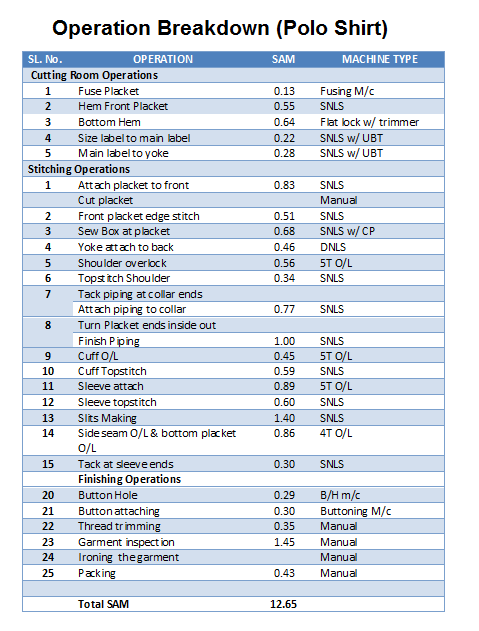 One sample operation breakdown of Polo shirt is shown in the below image. The garment operation bulletin is also called as operation breakdown. An operation bulletin includes more information than the operation breakdown. I have posted an article how to make operation bulletin. In that post the method of making operation bulletin is explained. The operation breakdown of a garment is done to understand garment construction - like stitch class and seam types used in making the sample garment. To make a operation bulletin the first step is doing operation breakdown of the sample garment. To make the list of sewing machines and equipment for the style. To set set a line for new style operation breakdown is followed by line supervisors and engineers. While estimating thread consumption per garment for given style, operation breakdown id referred for operation list and machine types. Definition of operation breakdown, and its application in the garment industry.